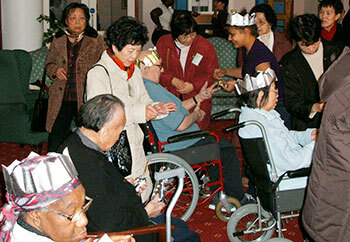 On 4th December 2005, a delegation of over thirty See Yep Chinese Association members led by their Chairman Mr Ken Tam, and the Chief Executive of the Ladies Group Mrs Nancy Chan, went to visit the residents and staff of Granby Care Home in Liverpool. They presented the residents and staff each with a basket of fruit. 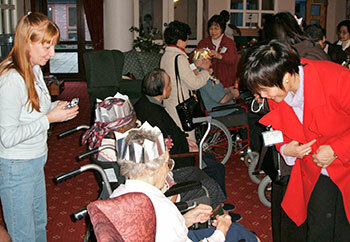 The staff of the care home warmly welcomed the delegation of their kindness. 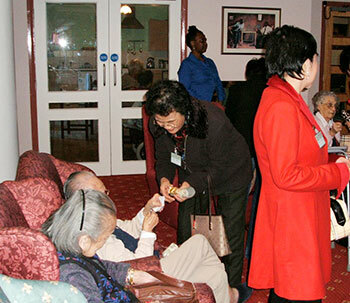 As soon as the delegation arrived at the care home, they assisted the residents to their seats in the main hall. Then they proceeded to present them with their Christmas gifts, and help them to put on their Christmas hats. The residents consisted people from many different cultural backgrounds, who enjoyed the pampering the delegation was giving them. laughter was echoing in the hall as they were having a brilliant time. The delegation felt quite emotional. As there were two residents had admitted into hospital, some members of the delegation went to visit them there and presented them with their Christmas gifts. See Yep Chinese Association’s Ladies Group felt they have achieved something which benefited the community. This was due to the diligence and team work of their members, especially the See Yep Chinese Association’s Chairman Ken Tam, Deputy Chairman Fook Yin Yung, Honourary Member Sun Mei Yan, Fook Kay Yung, Wan Yee Chan, Treasurer Hung Hoy Chan, Ladies Group Chief Executive Nancy Chan, First Deputy Chief Executive Siu Ying Yung, Deputy Chief Executive Shui Wai Lee, Mei Ling Lai, Lin Guai Yan. After the event, Mrs Nancy Chan said, “doing something worthwhile for the elderly is very comforting for us. The cooperation from our Ladies Group members makes me feel apeace with myself. Making contributions to the community re-enforces the See Yep Chinese Association’s ethos.